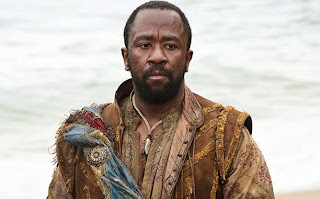 Lucian Msamati, who plays the pirate Salladhor Saan on Game of Thrones, won't be the first black actor to play Iago. In the early nineteenth century, an African American played the part in New York's African Grove theater, where the first internationally famous black Shakespearean actor, Ira Aldridge, got his start. In recent decades, other black actors have played Shakespeare's creepy Machiavel. But Msamati will be the first to play him for the Royal Shakespeare Company. The Independent reports that Msamati will play the role opposite Hugh Quarshie's Othello during the RSC's summer season.